Poor Battleborn. We commended Gearbox's team shooter for its tactical depth, arresting visuals, and colorful cast of characters, but it just never quite garnered a large enough audience to sustain it. 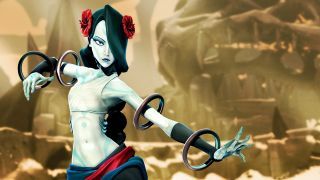 This week, the game's creative director, Randy Varnell, announced on the Gearbox Forums that development on Battleborn has ceased, and it will no longer receive new content or updates after the upcoming Fall Update. "If you’ve been paying attention to recent news from the Gearbox Panel at PAX West, you’ll have heard that many folks at Gearbox are working on a highly anticipated project. Although I’m sad my time on Battleborn is coming to a close, I’m happy to announce that I will play a significant role on this highly anticipated but unannounced game, and I’m sure you’ll be hearing some from me again in the future regarding Gearbox games." For reference, Gearbox CEO Randy Pitchford said during a PAX West panel that most of the studio was "working on the thing I think most of you guys want us to be working on." This was said after talking about fans' love for Borderlands, leading many to believe a Borderlands 3 announcement is imminent (though to be fair, Pitchford never actually said "Borderlands 3"). In any case, it sounds like Varnell will be taking his lessons from Battleborn and applying them to future projects. Fans have been taking the news surprisingly well. "I knew this day would come eventually, though it hasn’t kept the tears from welling in my eyes. Thank you Jythri. For everything," wrote one player. "A commendable and noted effort," said another. Over on Reddit, one user called it "A wild journey. This game was like multiplayer Morrowind for me, it might be half broken, but the ambition and the love that went into it makes it so much greater than the sum of its parts."